The relationship of Cowbell and Maths hit a milestone this year as it celebrates 20 years of rewarding and celebrating secondary school students thriving in the Mathematics subject in Nigeria. To mark this celebration, a special edition of the Cowbellpedia show titled ‘Cowbell Milk of Kindness’ was aired last week. It highlighted the remarkable contributions of Cowbell Milk to Mathematics in the country through the voices of student participants in a special ‘docu-feature’ produced to commemorate the relationship between Cowbell and Mathematics in the last twenty years. Parents, teachers, students, and other stakeholders in the education sector have applauded Promasidor Nigeria Limited, the company responsible for this revered platform, for this continued support and sponsorship of this program. The impact of the mathematics quiz show has been massive in arousing and re-awakening the interest of students, especially at the secondary school level as testified to by several teachers. One such teacher, Mr. Hamzat Dankanawa, of Nigeria Tulip International College, Abuja who has been in the profession for over two decades. With a vast knowledge in tutoring Mathematics, Danakawa towered above his peers for been able to motivate students to participate in the Cowbellpedia competition consistently over the years. As a mentor and teacher, he equally noted that the impact of the competition on the students could not be quantified as the programme has helped the students to expand their horizon in the subject. Another teacher with Federal Government Science Academy, Suleja, Niger State, Mr Olugbenga Otunnubi also remains a shining star in his commitment to teaching and nurturing students for Mathematics and participating in Cowbellpedia competition for several years. Otunubi, with about three decades experience as a teacher, is described as an exceptional Mathematics teacher by his colleagues. He also lauded the Cowbellpedia initiative for its impact on the lives of students and future inventors. Mr. Femi Fasotito, the teacher of the 2015 and 2017 champion Munachi Ernest-Eze, commended Promasidor for what he described as an unparalleled intervention to support Mathematics education in Nigeria. Munachi himself, who was a student of Loyola Jesuit School in Abuja, got N750,000 as the junior champion in 2015 and N1 million as a senior champion two years later, in addition to educational excursions outside the country. Munachi’s parents, Mr. and Mrs. Ike Ernest-Eze disclosed that Promasidor and Cowbellpedia have made them the happiest couple and parents in the world. In 2016, Promasidor began to encourage mixed schools to present a minimum of two girls for each category to represent them in a bid to promote girl-child education further. A direct impact of the girl-child campaign championed by UNICEF was felt in 2016 when 8 of the 12 finalists in the Cowbellpedia Secondary Schools Mathematics TV Quiz Show competition were girls. Recognising this effort, Ms. Jean Gough, Country Representative of the United Nations International Children’s Emergency Fund (UNICEF) In her Goodwill Message commended the Cowbellpedia team for its commitment to education for all in Nigeria. She maintained that investing in girl education is perhaps the most cost-effective opportunity to break the cycle of poverty permanently. Ms. Jean Gough was represented by Charles Nzuki, Chief of Field Office, UNICEF at the 20th-anniversary celebrations. 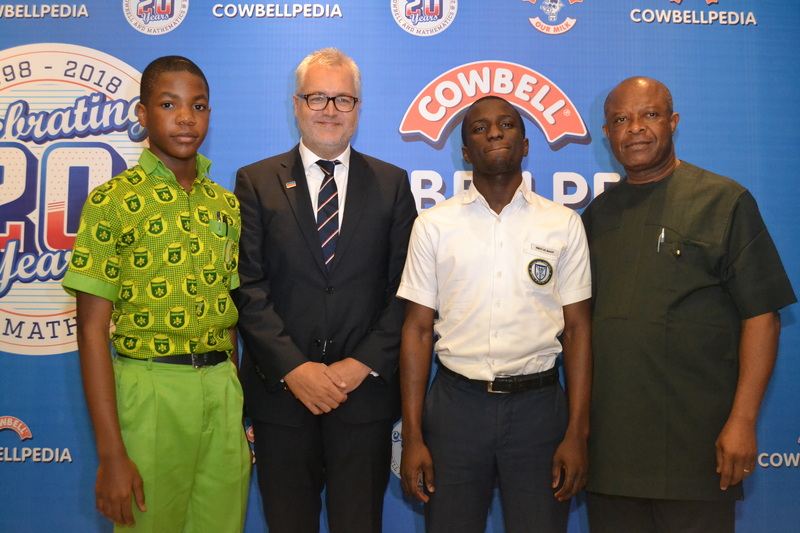 An impressed National Examination Council (NECO) also commended Promasidor for stimulating the interest of Nigerian students in Mathematics through Cowbellpedia. From its beginning in 1998, Cowbell and Mathematics have expanded in size, scope, and prizes. It now holds in over 200 centers across the nation and over 11,000 schools. To further underscore its expansion, the number of students participating jumped from 33,269 in 2015 to over 50,000 in 2017. In 2018 registration took a new turn to strictly online from which over 40,000 students registered and sat for the examination conducted on Saturday, February 17, 2018.